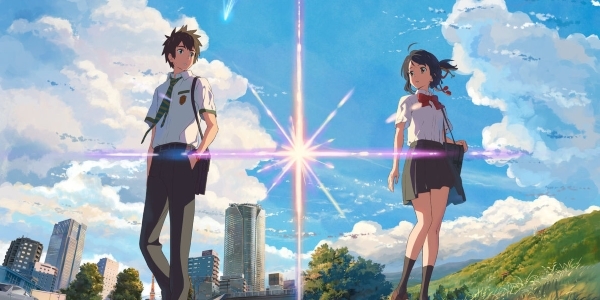 Propeller Anime: Makoto Shinkai's "Your Name" in theaters today. We're going! Makoto Shinkai's "Your Name" in theaters today. We're going! After much anticipation, the latest film of renowned anime director Makoto Shinkai (Voices of a Distant Star, 5 Centimeters Per Second) comes to movie theaters in the United States. Your Name opens today throughout the country. It has earned numerous accolades and has already became the highest grossing anime film in the world and 2nd-highest grossing in Japan behind Hayao Miyazaki's Spirited Away. Mitsuha Miyamizu is a high school student in the rural countryside of Japan. Taki Tachibana is a teenager living in Tokyo. As a comet approaches Earth, their dreams and lives start getting entangled. One day Mitsuha wakes up as Taki. Taki one day wakes up as Mitsuha. For a few days they sporadically switch bodies until one afternoon they lose complete contact. We are going to see it today, Friday, April 7th, at the Regal Waterford Lakes theater for the 7:20pm showing. We will meet up before 7pm in order to sit together.